At the ripe age of twenty-one and a senior at Columbia University, Anthony da Costa embarks on the release of his latest album Secret Handshake. In 2009, Anthony was named an MSNBC.com “Top 5 Up-&-Coming Young Singer” and a “WFUV-FM New Artist To Watch”. In 2008, he released two critically-acclaimed albums and was a Folk Alliance “Emerging Artist of the Year” nominee. In 2007,at 16, he became the youngest winner ever at the Falcon Ridge and Kerrville Folk Festivals. 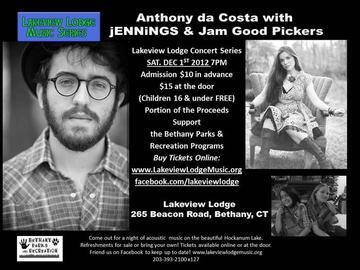 Standing just a shade over five feet tall, Jennings delivers a robust and heartfelt sound that is anything but small-scale. Her music reflects an enormous strength and drive that is uniquely hers, combining a deep range of rock and pop influences with an unabashed sense of vintage style that few, if any, could ever pull off. “I believe that the difference between an artist and the average person is a fearless and relentless willingness to expose their quirks, oddities, secrets, and passions for all of the world to see and hear.” says Mary.